With our years of experience backed by our infallible and incredible mathematical algorithm that specialises in pinpointing soccer draws, be rest assured that with us, you will beat the bookies CONSISTENTLY. 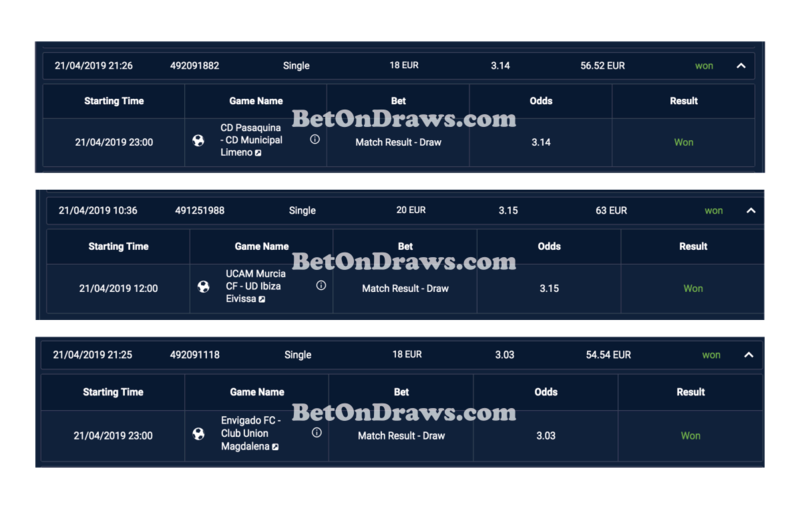 Just one selection out of 3 chances and you get over 3 odds is much safer than about 4-5 accumulator picks to get same odds. With Accumulator bets, your chances of winning decreases by ten folds for every one more game you chose. Our expertise in picking draws matched with Our ingenious Increasing Stake Betting System means your chances of losing are virtually non-existent. Non of our VIP members has failed to win thousands of Dollars monthly in the long run. Over the past 6 months, we have averaged 39 successful draw picks per month. This translates to over $2,400 (39 draws x 3.12 odds x $20). Ask and get our Draw Betting History and also read screenshots of real human testimonials to see for yourself.